Bored cat? There’s an app for that! 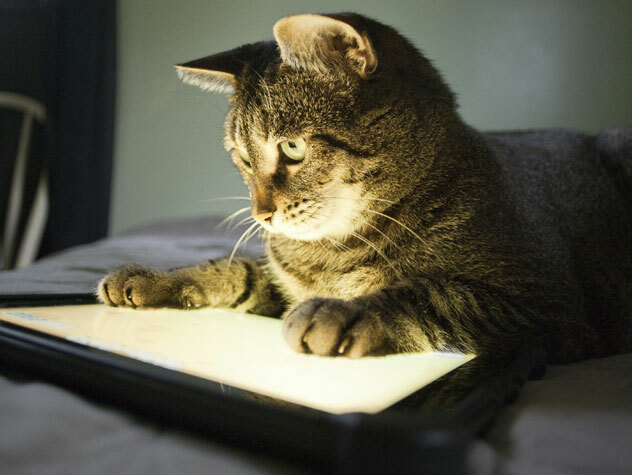 If you’re looking for ways to keep your cat busy and stimulated, try downloading a free smartphone or tablet app designed just for cats. It’s well known that apps can help keep us humans busy when we find ourselves bored, but you may not have considered this as a remedy for your pet’s boredom as well. Below are a few free apps that you may want to consider the next time your furry friend is acting bored, as well as some tips for getting your cat interested in these types of games. 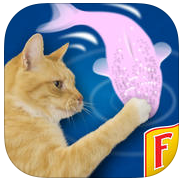 Friskies® new Cat Fishing 2 is an all-new game designed especially for cats. 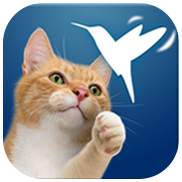 Tap “start” and get ready to watch your cat go for the catch of the day. The more she catches, the more challenging the game gets. Three levels of fun with one, two, and three fish at a time. And when the game is done you can share your cat’s score on Facebook, or post your cat’s high score on the worldwide Leaderboard. 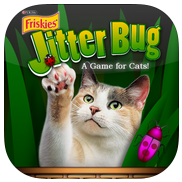 With Friskies® JitterBug your cat can practice catching little bugs. In Game mode, there are five fifteen-second rounds to catch as many bugs as possible, and then you can share your cat’s score on Facebook. There’s also an Advanced Mode where you can select how many of each kind of bug will appear. Advanced mode also features an Endless Play option, so your cat can practice as long as she likes. To exit Endless Play mode, simply shake the iPhone or iPad, and it will return to the main menu. Friskies® Happy Wings welcomes your cat to a garden full of flittering critters, including a charming hummingbird, an irresistible moth and a little dragonfly. Watch these critters dance across the screen in teasing patterns to attract your cat’s attention, and enjoy multiple garden settings with ambient sounds. For each level, the game setting changes, the patterns become quicker and multiple creatures appear together. Once the game progresses through a few levels, your cat is rewarded with a “You Won” and a cat-friendly “Play Again” button. So, presumably, your cat can participate in continuous play without human intervention. Turn out the lights. A lit screen in a dark room will help grab their attention and keep it. Don’t leave your cat alone with it. Unless you want a broken screen when Kitty manages to knock it off the table, or teeth and claw marks when he decides to chew the sides, this is a toy that requires attentive supervision – for your cat’s safety as well as your mobile device’s.We’ve found that the bare glass screen on most tablets and phones will hold up to cat’s claws with no problems, but their claws could damage add-on plastic film ‘screen protectors’. Show your cat how to play – and make it look fun! Play with the app on the floor in front of your cat. Touch the screen to make, say, a fish dart away. It may take a little while, but your cat should get the idea that pawing the screen in certain places makes it more fun to watch. Let your cat go at his own pace. No one likes having something shoved in their face – including your cat. Whatever you do, do it slowly and nonchalantly. Don’t force your cat to play, and let him walk away if that’s what he chooses to do. Just try again later. Enriching your cat’s environment is a must and a great way to make sure they have fulfilling, stimulating lives.